I love it! 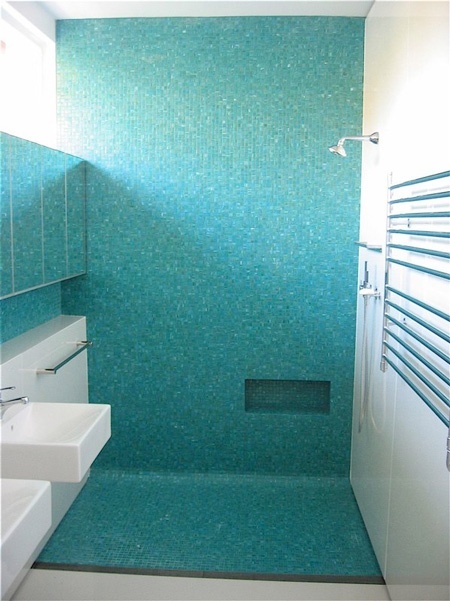 You can usually date a bathroom remodel by the style of the tile. You will leave them guessing! 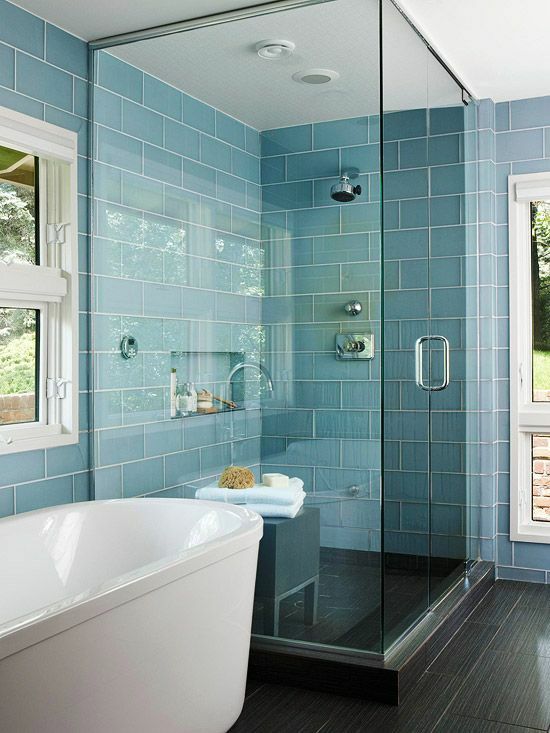 I a so tired of those stripes of narrow horizontal tile being used as backsplashes and in showers. Floor to ceiling all the way, Baby! The color is awesome! Can’t wait to see the finished product. 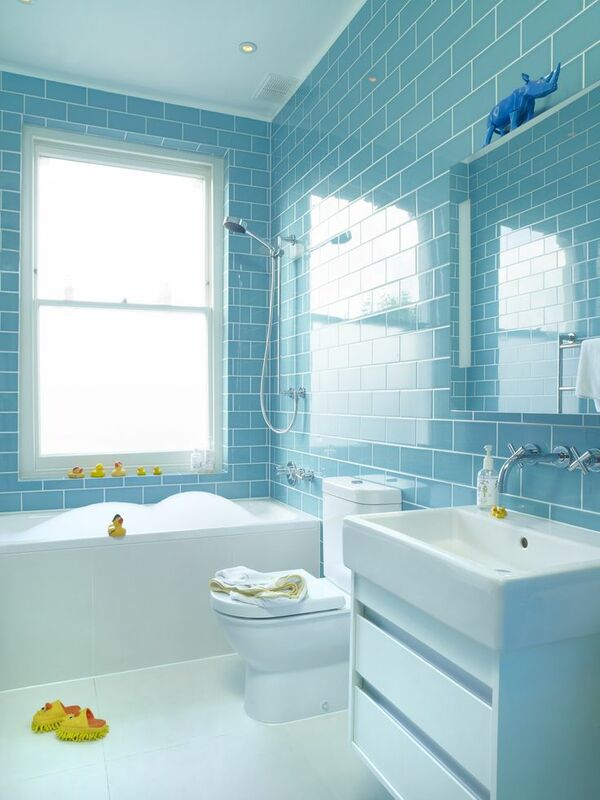 I know everyone is in favor of plain white subway tile lately……we’re shaking it up a bit. Wish there was an edit button… I’m barely awake, having been up not long. As I said, all of these are lovely, though two stand out of the photos you showed. The third from the bottom with the turquoise waterfall accent wall and backsplash with the rest of the room white to allow for the turquoise to pop, though I would go for some wood to warm up the space just a touch. 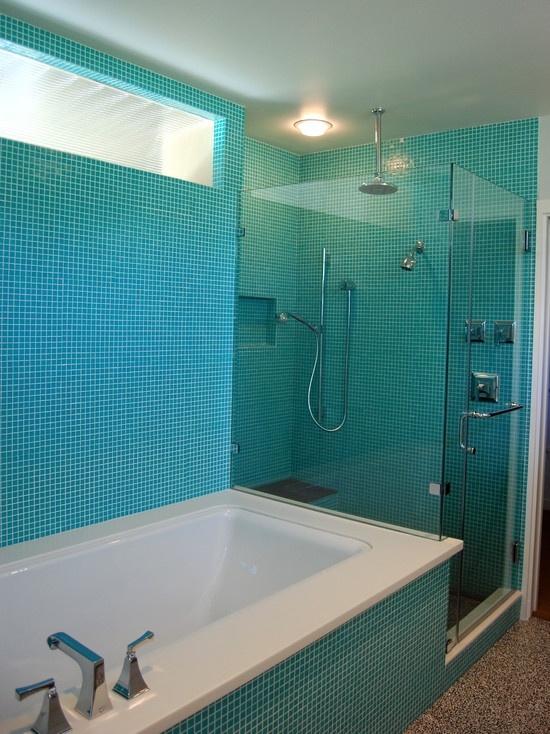 Then three photos up from it is the one with the partial wall to divide the shower from the dry areas of the room. 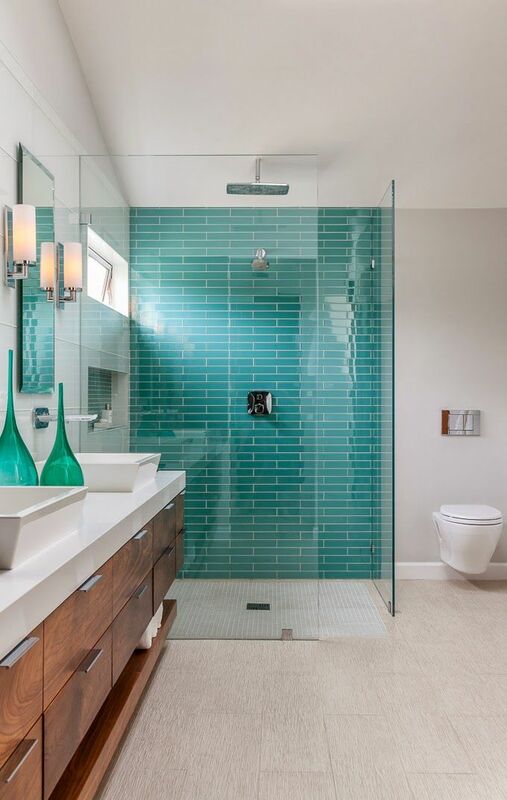 I love that deep turquoise on the back wall, lit by a wide skylight. 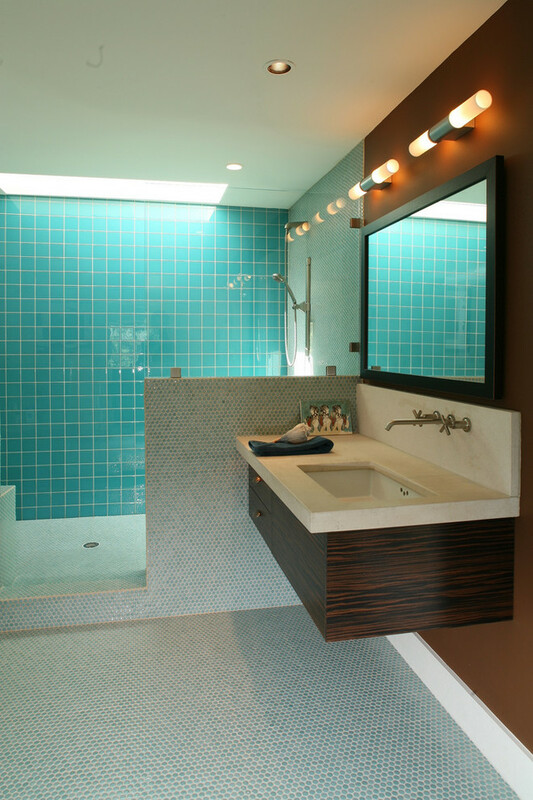 The whole space as kind of a retro feel to it and love how they used a small tile that has a hint of the blue in it for the floors, the half wall for contrast, and warm it up with some nice teak like wood for the cantilevered vanity. 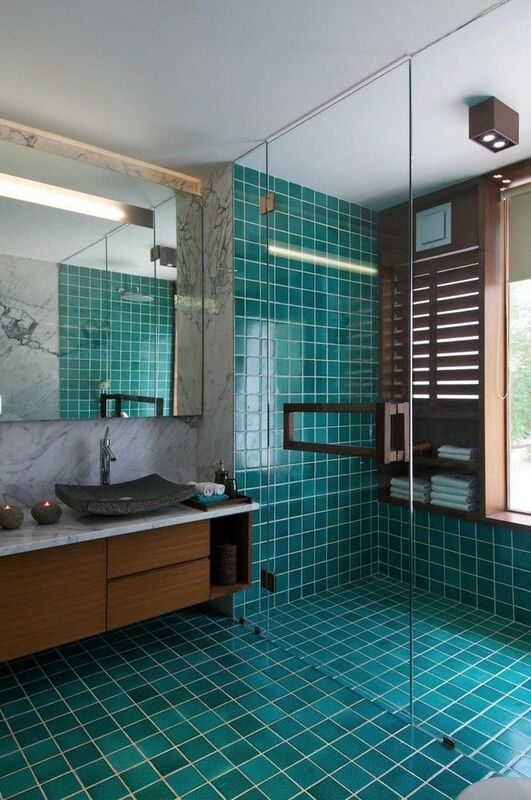 If I had to redo a bathroom, it’ll be something like that, or replicate the vintage bath in a 50’s, or 60’s era bathroom if possible, and turquoise is one of the colors I’d consider. Didn’t need persuading…I trust you! What’s not to love, Pam? I cannot wait to see how well you pull this off! I have 100% faith it will be amazing! Get tiling guys! Check out the House of Turquoise blog. I follow her and now you guys. I think it will be stunning, can’t wait to see the reveal! OHHH shucks Pat…..I didn’t know that I had to achieve expectations! We better get going…. You baited us with the tile colors in July….it’s the middle of August. Where is your bathroom progress report??? Anxious to see you completed room. Hopefully before Halloween!!! I really enjoy your blog. One of the best blogs…if not the VERY best, I read. I love your styles, humor and zest for life. Thanks for sharing your lives with your followers..
Awwww Kathleen, you are too sweet. We’re so tickled that you’ve been following along so feverishly. There’s been a few “setbacks” with the bathroom…..Unplanned travel, family emergencies…and we actually had to stop work and call in a pro to UN-do a few steps that we/plumber #1 did wrong. OY! I just knew that a few o y’all would wonder why we would start a second big project so soon. (So did we) I said back in Feb that there was no rush,but I promise, we’ll be back in that little bathroom soon.